There will be one last campaign event at the First United Methodist Church at 1376 Olive St. on Tuesday May 8th 6:45 - 8:30 PM to have all three candidates present their views. There will also be opportunites for questions. Endorsed by the local Our Revolution (Bernie Sander’s Eugene Group) on Saturday April 28, 2018. Freedom of Aerial Spraying Alliance (FAHA) and Our Community Our Rights (OCOR) also endorsed my campaign. This was recorded at the Our Revolution Meeting on April 14, 2018 in Eugene, Oregon. For a longer more in depth interview of me please see April 21, 2018 recorded at the Cable TV Lane County channel 29 studio in Eugene by Joe Tyndall. Here is the April 27, 2018 talk at the Eugene Garden Club. Victor received a total of 2604 votes representing 10.61 percent. Here is the Register-Guard Article. Thanks to all those who helped make this happen. I am so grateful !! 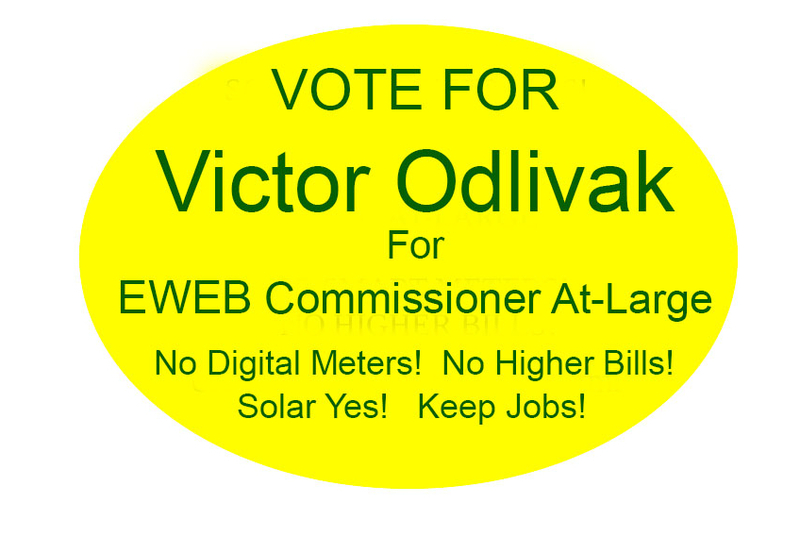 I, Victor Odlivak am running for EWEB Commissioner AT-LARGE position in the May 2018 primary in Eugene. I have worked for the last five years to stop smart meters in both Seattle and Eugene with the Families for Safe Meters. I was so fed up with the reversing of the OPT-OUT to automatic OPT-IN policy that I am running to make an effort to change this and educate people. Note, this is a complete reversal of what was stated at the video at the City Club from Feb. 17, 2017 . Frank Lawson says at the 47:00 minute mark that he is all for the automatic opt-out policy. He has totally reversed himself not listening to the people. See the EWEB Smart Meter FAQ which states the new policy: "If I opt out can I keep my old meter? No. We are replacing all meters in our service territory over the next eight years. If you choose to opt out, the radio in the new meters at your residence will be disabled.."
The important thing to realize is that Smart Meters are a big distraction from our real task which is to Get off Fossil Fuels . For a historical perspective, please see this AMI 2015 document from EWEB . Note in particular on Page 3 under Discussion: EWEB is presently "capacity (kW) resource short" and relies exclusively on the marketplace today to meet these shortages. We do not want to rely on the market place. We want to be the source of energy as ratepayer owner generators with more solar and greater energy conservation for all. How do we do this?? Here is a preview of my election pamphlett statement. All of New Mexico just decided to get off the Smart Meter/AMI bandwagon because of the problems I mentioned in my later section Dumbness of Smart Meters. See the article from Santa Fe, NM Newspaper. We need to follow the example of New Mexico. I will devote myself fully to implementing the policy I have layed out above. This will include office hours at EWEB for people to visit outside of normal work times. Since I am retired, I have the time to spend 10 days a month or more to follow through and research any agenda items for board meetings. I want to thoroughly investigate exactly where our energy and money is going. No extortion fees for Opt-out of Smart Meters. Our sisters over in other parts of Oregon now have to pay a fee of $137 plus a monthly meter reading fee of $36. You can read it right here from Pacific Power Comapny Opt-out Fees. Note Pacific Power used to be part of Con Edison Power Company. This can be the future for Eugene, if we do not watch out. Continue EWEB’s current generous support for low income individuals. This includes the Free Home Energy Assessment for renters, Cusotmer Care, Customer Care Plus and the Deposit Guarantor programs. Support Rental Unit Weatherization as EWEB’s next major conservation strategy. This would lower bills for students and working people. They are entitled to the same level of comfort their landlords have. Keep ownership of Harvest & Foote Creek Wind Farms. In the coming years when all the cheap fracking fossil fuel is gone, this will be a major asset. We must plan seven generations ahead as our native people said. EWEB takes extra money by donation to be green. How can they be doing this when they are trying to sell their Green Wind Farm? End now our long-term contract with the Seneca wood-burning plant north of Eugene. This is burning fossil fuel and putting Carbon Dioxide and other pollutants in the environment. Note in this video at the City Club from Feb. 17, 2017 . Frank Lawson says at the 45:00 minute mark how Seneca is not economically viable when questioned by Ruth Daimler City Club member. Drop the connection fee on our electricity bill! This would make the bill 20 dollars cheaper for all. Also us solar electricity generators would not charge a connection fee. This is only fair! Pay us the same rate for electricity generated as we pay EWEB when we purchase it in the winter months. That is 9 cents per KWH. We sell electricity back in the sunny half of the year and only get 3 cents per KWH. Springfield Utility Board (SUB) reimburses rate payer generators at the same rate they buy electricity. They also charge about 40 percent less for their monthly connection fee, that is $12.60 instead of $20.50 from EWEB. Double the EWEB reimbursement from 1500 to 3000 Dollars for solar PV installation. Move towards a 21st Century Distributive Renewable Energy Microgrid. This will protect us from the coming major Pacific Earthquake. Japan is already doing this. We need to follow. We must ask how much does it cost to build in energy all these centralized transformers and lines compared to local distributive generation by solar owner ratepayers? Peak Voltage: AC lines are designed for peak voltage, in DC power you can carry twice the power at steady DC voltages. AC power radiates and causes an efficiency loss that you do not have in DC power. AC high voltage often uses clusters of wires or cables. However HVDC can have just one large cable which is cheaper. EWEB definitely needs to consider implementing this in conjunction with other NW Power Utilities. Lastly connect with the mother earth! Keep our analog meters and let us watch them spin backwards. Once a year we can take a picture of the meter to verify the 500 to 1000 KWH it has turned backwards. This is truly a joy! Even on a rainy day, I still get 4 KWH of solar! There is never a zero KWH day! Do not lay off any more EWEB personnel. This is beautifully stated in an Oct. 2017 Letter to the Editor here . They depersonalize the process of giving good caring service to humans! Earlier, if somebody did not pay their bill for 3 months a human investigates and sees, Oh My God, this is a very poor person with 3 children living in a poorly insulated house. If the power is cut off now, the family could freeze to death. I will NOT cut off the power, the Meter reader reports. But Now, the Smart Meter, can automatically shut off the power with a Software Program. Or somebody can make a mouse click and your power is off. This is Outrageous! and should never be allowed to happen. We need to keep EWEB headquarters on its waterfront property Do not sell this land to developers! Preserve Mother Nature in all her healthiness Eugene is one of the few places in the USA with no fluoride in the water. We have to keep it that way. We need to be conscious of everything that can go in the water we drink. i.e. Stop now the Aerial Spraying of Herbicides from Helicopters This gets in our water. Make sure no factories are dumping chemicals in our water anywhere! Put all electric wires underground. This has been done in Berlin since 1875. You would not put a gas line above ground, so why on earth put a power line above ground? In Dec. 2016, when we had the big ice storm in Eugene, it took four and a half months to trim all the trees back so they would not interfere with the power lines. We imported contractors from Indiana to do this and had to put them up in hotels. We had pledged in 1987 to put all the lines underground and we still have not done it!! People would donate freely to a fund to do this so that they do not have to experience power failures again. I am currently retired and have been working the last 6 years as the volunteer treasurer for ASALV , a non-profit for rehabilitating street children in Nicaragua. I also volunteer with Community Rights Lane County working on the banning of Aerial Herbicide Spray and giving mother nature the rights of a person. I have a B.A. in physics from Earlham College in Richmond, IN. and spent six months studying Appropriate Technology at the Farallones Institue when it was in Occidental, CA in 1983. This included Wind, Solar, Hydro Power and Biogas. I worked two years as a high school physics teacher and 25 plus years in tech support in the computer field. This included working with wind, solar and hydro power energy forecasting at 3Tier Inc. (now Vaisala) In 1985 - 1989, our volunteer group set up the entire recycling operation for Watertown, MA including building the ramps and bridge to load up the glass and metal containers. Smart Meters/AMI greately complicate the process of measuring owner-ratepayer’s energy usage. This was said by Frank Lawson in the video at the City Club from Feb. 17, 2017 . Frank Lawson says at the 39:00 minute mark that EWEB should stress four principles safety , reliablility, affordablility and not making things complicated. We are just asking him to follow his own advice here. Smart Meters are not financially viable. The Smart Meters are only guaranteed for 2 - 10 years verses 40 - 60 years for the analog. They require setting up Time of Use Billing, antennas, transmitters and other equipment. An outside vendor would have to set up a computer system for the Time of Use Billing. The city would then be at the mercy of that vendor for any changes to the system. The actual energy savings from Smart Meters is null for the average household. Nobody is going to get up at 3 AM to run their dishwasher or do their cooking. Our sister city Springfield, OR on the other side of the river decided to hold off on deploying AMI (Advanced Metering Infrastructure) at this time. They will not presently (March 15, 2018) according to Jeff Nelson (SUB Manager) be setting up Time of Use Billing, antennas, transmitters and other equipment. They want to take more time and see how AMI develops. Burst into fire or CUT OFF POWER instantly . This has happened so often that Saskatchewan Province in Canada has outlawed them. Note, the fix for this that EWEB implemented is to buy the "smarter" Smart Meters made by Sensus. If they get too hot, they automatically shut off! But what if you are asleep at night with a medical device to breath more Oxygen into your lungs . Many people suffering from Emphysema have this. Are we going to immediately dispatch people there to turn on a backup generator for the household? Do we have several hundred personnel ready at all times to do this? The old mechanical Analog meters never got too hot and cut off power. We are setting ourselves up for a very horrific situation here! I asked Frank Lawson in person with our entire Families for Safe Meters group, if they have a data base with all the people on ventilators and what medical procedures they have in an event of a Smart Meter shutoff. They had no answer to this!! Put out an immense amount of Microwave Radiation in the 1 - 300 Gigahertz bandwidth. The energy of the radiation is 10 K what your cell phone emits. This is a major health hazard . This causes massive headaches in people, dizziness, nausea and cases of brain cancer have been documented. In the film mentioned below, all the birds that a gentleman in Renton was feeding suddenly disappeared from the area, once the smart meters were installed. If you can not go to the performance of the film, you can download it and just pay whatever you like. Please see the website also referenced below. Thank you ! !